Although it sounds counter-productive, certain oils can be extremely healthy for oily or acne prone skin. 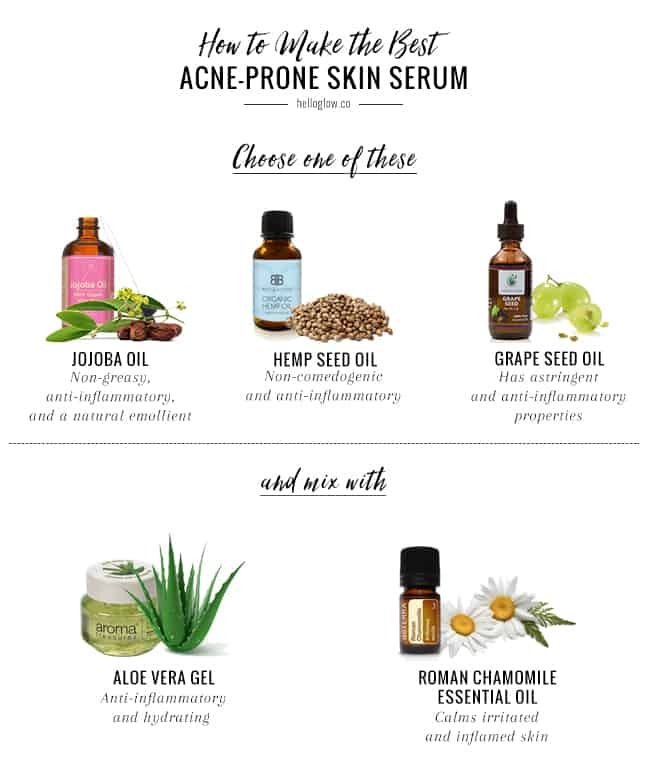 While most people think the cure to acne is stripping the skin of all oils to decongest clogged pores, oftentimes this causes the opposite effect. Our pores can respond to this lack of moisture by producing even more oil, causing more clogging and breakouts. The key is to find the right type of serum that will penetrate the congested pores, while healing and soothing the inflamed skin. Jojoba oil mimics our body’s natural oils and is a great multi-use oil for moisturizing skin. It’s non-greasy, anti-inflammatory, and a natural emollient. Hemp seed oil is non-comedogenic, which means it won’t clog pores, and it has anti-inflammatory properties. It protects the skin from free radicals and helps maintain skin’s elasticity and softness. Grapeseed oil has astringent properties as well as anti-inflammatory properties. 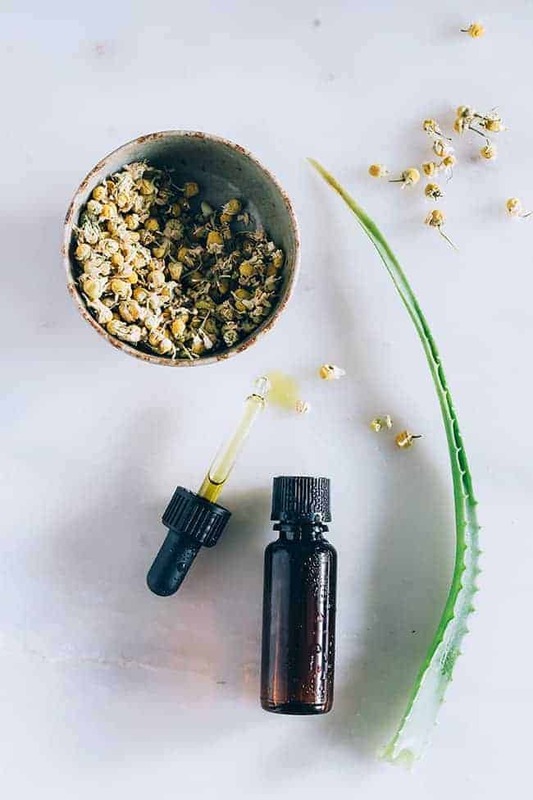 It helps regulate skin’s natural oil production and brightens it with Vitamin C.
Chamomile essential oil will calm irritated and inflamed skin, while aloe is anti-inflammatory and hydrating, boosting skin’s natural healing. Lavender, tea tree, and frankincense essential oils are all effective at diminishing acne and scarring and can be swapped in for the chamomile oil if you already have them on hand. 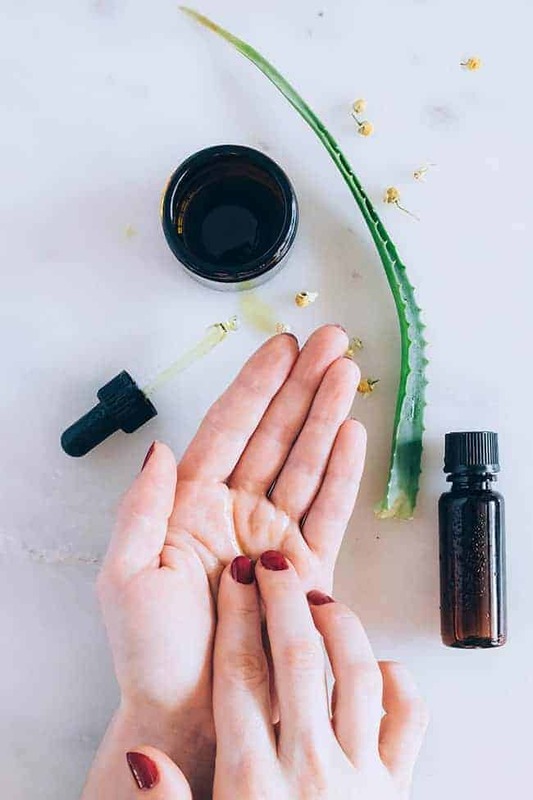 To use, place a pea size amount of the oil in the palm of your hand and add a few drops of aloe vera gel, mix together and apply all over your face and neck. I’m just a normal 30 year old female with cystic acne. Painful, annoying, ugly looking… not awful, but enough to bother me and leave patches of trouble skin on my face. I’ve been washing my face at night and applying dermalmd acne serum over the troubled areas and my morning the swelling is significantly reduced!! I sometimes also apply in the morning. I have bought other acne topical treatments that have not helped anything like dermalmd has helped! Totally worth what I paid for it. Just some advice- shake it before pump it. It settles and leaves a watery substance on top. Otherwise, no issues at all! Give it a try! Is this a serum that should be used every day, or like nightly before bed or something? What’s the recommended use for it, to get the best results? Really good information here! Great post! Hi, if i put 1 fluid ounce of carrier oil (app. 30 ml), I should add 2 drops of essential oil. How long can I store the mixture in a bottle? since I only need a few drops per use, 30 ml is still a lot. I must share this with my son. He has an acne problem. Can’t the aloe Vera be mixed into the oils? I know it would have to be shaken well before using, but I’d like to make this for my 15 year old granddaughter, and I doubt she’d use it if she had to combine the two each time. If you add water or Aloe Vera to the bottle, you’d have to add a preservative to ensure that bacteria, mold and other fungus doesn’t creep into your concoction. You can try to refrigerate but your mixture would only be safe for a few days. Without a dedicated preservative, your sole solution is really to make very small batches, that can be used in a few days. I must recommend these to my mum.